Ikuburuju Alex, an official of the Lagos State Environmental Sanitation and Special Offences Unit has landed in trouble over alleged bribe. 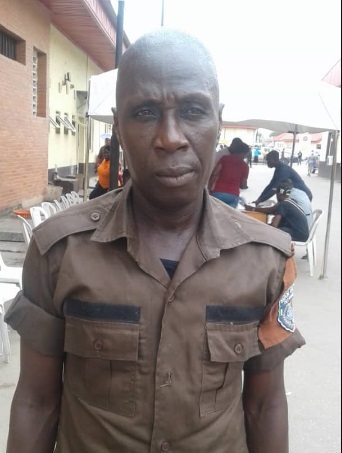 The said officer, whose name was given as Ikuburuju Alex, allegedly committed the offence at Ikorodu, where he single-handedly billed and collected the sum of N30, 000 from the owner of an impounded vehicle. “On that fateful day, I was having a lecture with all my police officers at Bolade before the indicted paramilitary officer went and carried out the shady deal, knowing fully well that there would not be any police officer on ground at Ikorodu”, Egbeyemi said. Bubble bust on the officer when the Agency stumbled on social media reports on the incident following which, investigation was conducted and found the story to be true. He, however, urged members of the public to take it as an obligation to report to the any officer found misbehaving in the course of discharging his/her official duties to the Agency for appropriate sanction.